Use a high-resolution digital camera - anything 4 mega-pixels and greater is good. Many cell phone cameras take poor quality photos. The iPhone and other similar smart phones are an exception. Hold the camera still so the picture is not blurry. Strong outdoor lighting helps with this since it gives you a fast exposure so you don’t have time to shake while the picture is taken. Place your painting in indirect light to avoid glare. Often outside on a front or back porch, when the porch is in shade, works very well. Indirect sunlight also usually gives you the most accurate color balance. Fill the viewfinder with your painting, as much as possible. Hold the camera square to your painting so its right angles look like right angles in the picture. Most digital cameras do quite well with capturing the correct color balance and contrast, so the only post-processing you need to do before uploading your image to either your blog or DPW is to reduce both the file size and resolution of the image. The file size of your image is how much room it takes up in your computer and on DPW. Since there are thousands of images on DPW, we want your image to be as small as it can be, while still being a high quality image. We have found this balance can be achieved if your image file size is no more than 10 megabytes (mb). Most digital camera photos are smaller than this. Always let your eye be the judge of your image’s quality. If it looks good to you, it will look good to everyone else. All digital images are made up of little tiny dots of color. The more dots, up to a point, and the clearer and sharper your image looks. These dots are called pixels. Additionally, if you have enough pixels, then DPW will turn on a nifty zoom feature when someone mouses over your painting image. This can go a long way in helping your sales by letting buyers see your beautiful brush strokes. 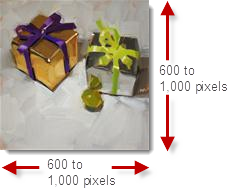 The number of pixels, specifically how many across and how many down, is called the resolution of the image. Your images for your blog posts and for uploading directly into DPW should have no fewer than 600 pixels down or across. The more your image has then the greater the magnification of the zoom in DPW will be. Like with anything, too much of a good thing is no longer good. So, you might want to play around with the zoom by uploading different resolutions through the Art Tracking grid to see which looks best to you. We have found that about 1,000 pixels down or across, which gives a 2X zoom, works pretty well. Picassa is a good free tool to use to process your images. Posted - Mon, Jun 13, 2011 at 1:13 PM. This article has been viewed 19299 times.